It's been a mild winter so far, and right now it feels like premature spring. 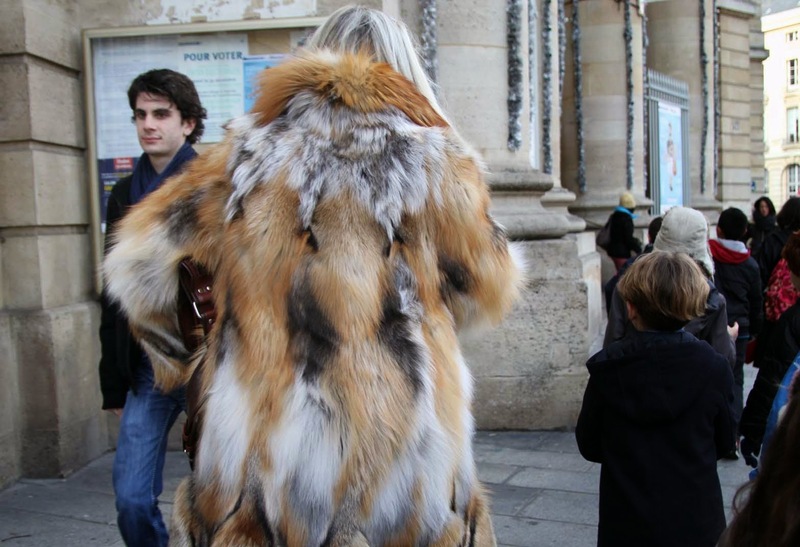 But when the thermometer dips to freezing and below in Paris, you can walk outside at any time and see women (mostly of-a-certain-age) in their fur coats and hats. Russian style furs, black furs, brown furs, real furs, fake furs, fur linings, fur accents, ermine furs, sable furs, mink furs (oh, who am I kidding? You know I don't know the different types of furs...). Perhaps many of them are handed down from previous generations, which is what I like to believe when I see them. Well, they can't all be inherited furs, because I see this display at the Bon Marché, one of the snazziest department stores in Paris. It's a PETA nightmare! Given the prices, I'm guessing it's all real. 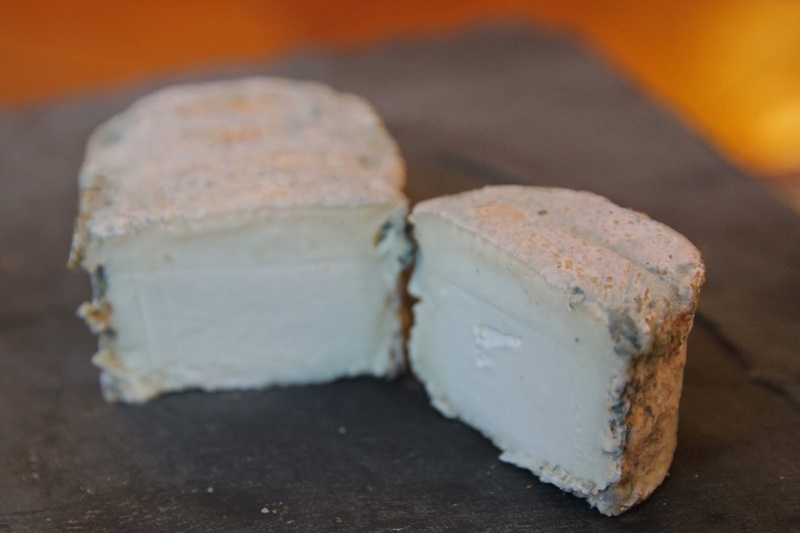 This beautiful little raw milk goat's cheese, which is marked "Le Monistrol du Chêne" where I buy it in the Laurent Dubois store in the Marais, is actually called "Doux Chêne" by the farmer that produces it, in Haute-Loire, central France. "Chêne" means "oaks" and is a reference to the trees surrounding the farm in in the gorges. Monistrol is simply part of the name of the town where the farm is located, and the word "doux" means sweet or soft or mild and, in this case, refers to the oaks, not the cheese. No matter what you call it, it's a wonderful, beautiful, noticeable farmhouse cheese. The farm's herd of 140 Alpine goats pastures in the gorges of Allier in the summer, and is fed mountain hay in the winter. 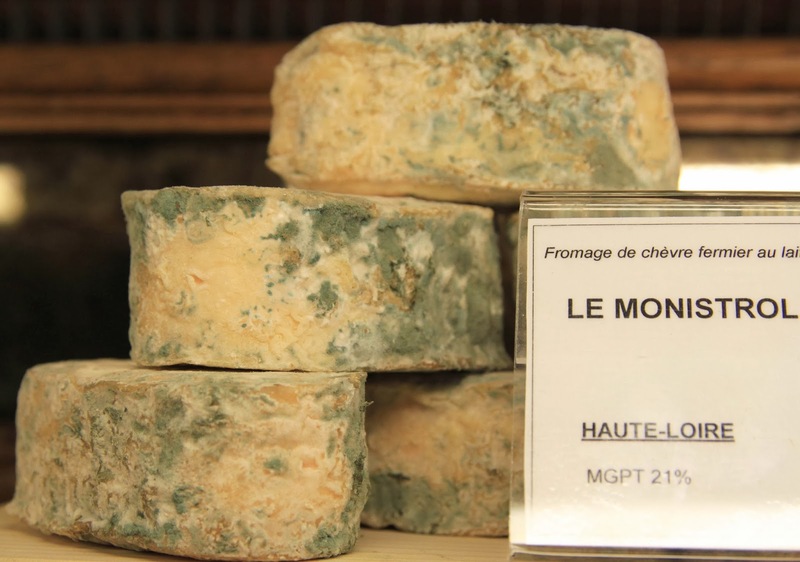 Doux Chêne -- or Monistrol du Chêne -- is very full-flavored, savory, and goaty with a lovely acid tang at the finish. It's a thick, solid, sliceable fist-sized brick of a cheese, and the creaminess comes through after you put it in your mouth and let it melt. Do not, under any circumstances, pass up the crust. 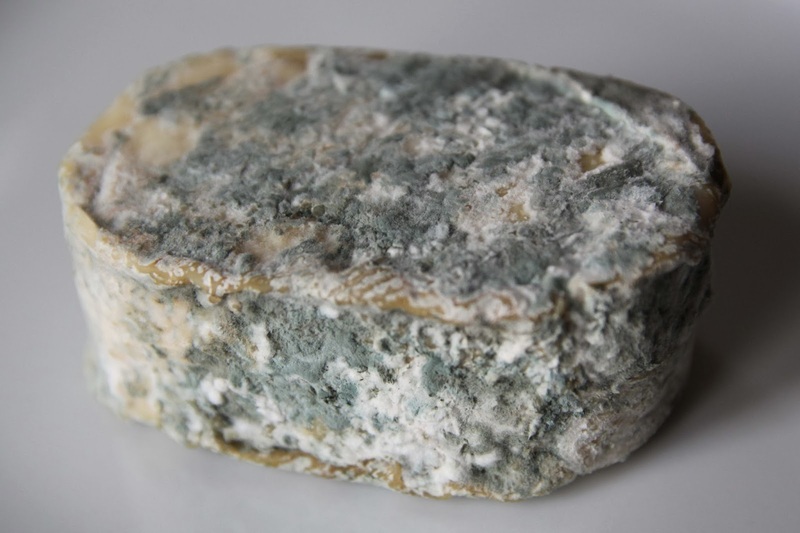 Though the mold may be slightly intimidating, especially when it's been aged at the upper end of its 2-3 week ripening period, it adds a wonderful texture to the cheese: the tiniest hint of chew and fuzz, sort of like a very fine peach skin. When aged, these little goat bricks get downright furry! Especially the older ones look like they're wearing little fur coats -- but fur coats for which no animals had to die; all fur-causing bacteria are alive and kicking (and still getting furrier).